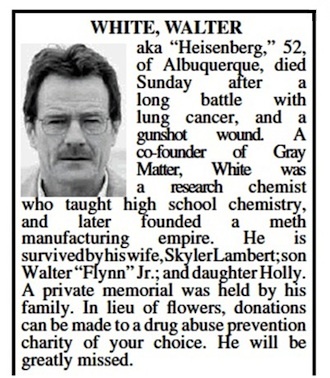 Breaking Bad and the reign of Heisenberg may be over, but one group of fans funded one last hoorah in the form of a real obituary for the beloved and entirely fictional Walter White. I liked the finale, if anyone cares, because it was subtle, like Walt’s life pre-meth, but I still think Skyler should have died during that knife fight, or maybe the break-in scene with the baby, or crossing the street. I also figure she’d have pretty high blood pressure from dealing with her husband and could have just dropped dead at the counter of the car wash place, but whatever.